Dimensions: 36T x 20W x 3D inches (plus magnet depth), 50 lbs. 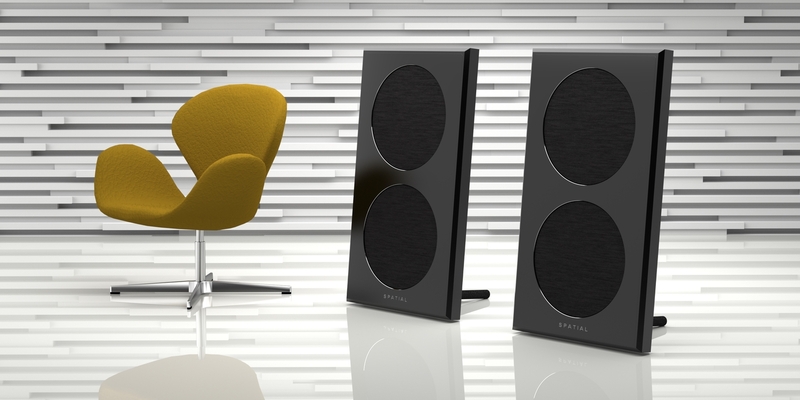 Spatial’s new Hologram series of loudspeakers incorporate a number of advanced design features that work together to achieve a more realistic reproduction of music than ever before. • Open Baffle Design – Eliminating the speaker box dramatically improves the sound of a speaker by eliminating all manner of box related resonances and re-radiation of sound from inside the box. A free-flowing ease and dimensionality is immediately recognizable as more like actual music and less hifi sounding. Bass is extremely detailed and realistic sounding, while the midrange is portrayed naturally, with an open, 3D presentation. The challenge of creating an open-baffle speaker with powerful bass is especially daunting, The Hologram series succeed in producing unprecedented bass performance in a compact form factor. • Point Source Design – A properly designed point source driver provides a coherent transition from midrange to treble and stable imaging by eliminating comb-filtering; the interference patterns found when the tweeter is physically separate as in most speaker designs. All three Hologram models exhibit phenomenal imaging and soundstaging. • Controlled Directivity Design – Dispersion angle is limited to around 80 degrees and held constant across the spectrum, allowing less interaction with the room and much more even response in reflected field energy. • Ultra wide band compression driver – The suspension design of our compression driver allows a very low crossover point at 800 Hz, providing coherent, high definition reproduction through the midrange and treble region. Since most of the midrange is produced by the low mass compression driver instead of the cone driver, a dramatic improvement in resolution and reduced distortion is provided compared to conventional speaker designs. • High-efficiency Drivers – The use of very high efficiency drivers provides outstanding dynamic response without compression effects. The mid/tweeter’s 108dB sensitivity essentially eliminates any compression distortion when used in domestic applications. • Linear Response – Uniform frequency response is critical to accurate music reproduction. Great care has been taken in voicing the speaker in the effort to reproduce natural pitch and tonal balance.